It’s graduation time … so much excitement for all the grads, parents and families. My friend Anne’s daughter Nath (Nat) just graduated and I asked Anne to take some pictures to show how scrappy supplies can make such a difference when decorating. An enchanted forest was Nath’s grad theme. The parents in charge of decorating, with the help of Anne’s scrappy supplies, used the Tim Holtz butterfly duo die to cut butterflies for the gals … and the cricut machine to cut dragonflies for the guys. They collected mason jars and moss to make the table centrepieces and found little battery operated string lights so they would light up. Lots of searching to find the twigs, branches, and poles to make the archway and backdrop for the head table … the result is awesome. I love how there is butterflies and dragonflies everywhere. On the graduates easels Anne modpodged their grad photos and used Ferro with stencils for the butterflies and dragonflies. These were set at every family’s table for people to write messages to the graduates so they would have them for keepsakes. A gorgeous photo booth was added to complete the enchanted forest theme. What a perfect addition to the day and evening. How awesome this all turned out, I can only imagine how it looked IRL. Super job Anne and helpers … the decorations and little details will have made this day extra special for everyone. Altering what you already have…. I wanted to do a quick blog post about using the items in your stash in new and updated ways. 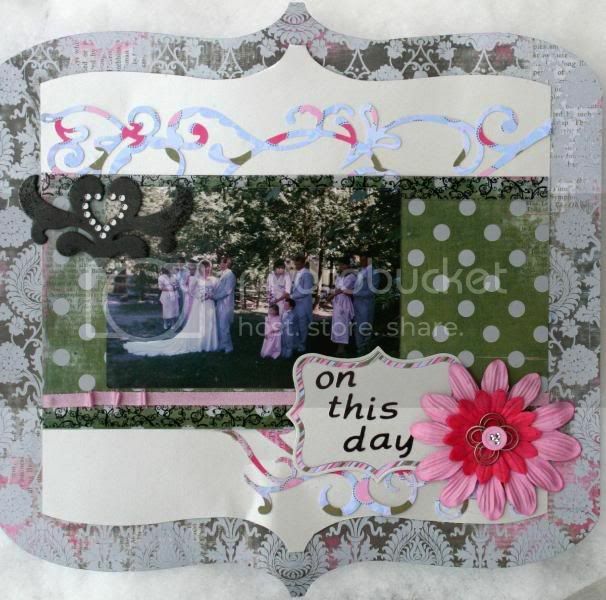 I find that I love items in my stash but they have either become a little dated or really don’t suit the layout or card that I am wanting to use them on. I find that once I combine elements or ink them up, the item is fresh again and fits right in with what I am wanting to use it on. 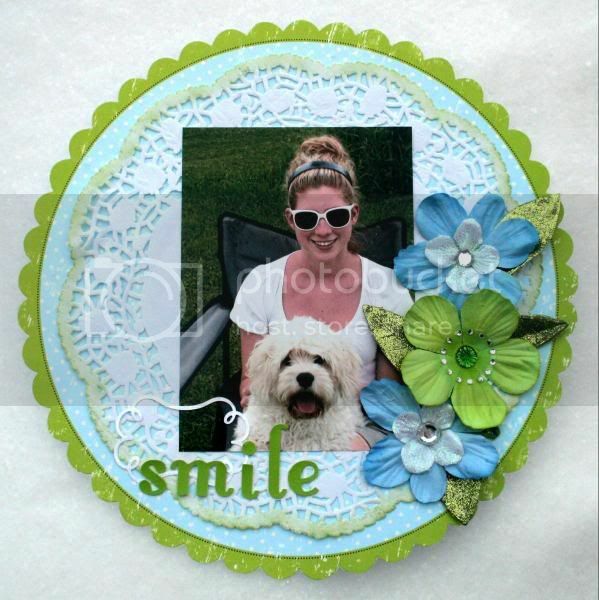 Case in point…… see the flowers that I used on this layout? The flowers are from Prima and all on their own really don’t bring much to the layout. I layered them with velvet smaller flowers and found interesting bling to add to the center. All of a sudden, the flowers are fresh again and add a pop to the side of the layout. I also tied in the big doily by inking the edge to compliment the lighter green colour. I did a similar technique with these flowers on this layout. I encourage you to try and layer your embellishments and see what you can create. The new embellishment will be one of a kind! !